Newly disclosed records from the office of Illinois Gov. Bruce Rauner document a pattern by the state of slow-walking and soft-pedaling bad news about deadly outbreaks of Legionnaires’ disease at a state-run home for war veterans in downstate Quincy. That pattern began with Rauner’s office early on putting a kibosh on informing the public about a 2015 Legionnaires’ disease outbreak that killed a dozen residents at the veterans’ home, state records show. July 24: Earliest known case of Legionnaires’ disease at the Illinois Veterans’ Home in Quincy, according to a report issued later by the Centers for Disease Control (CDC). August 21: Illinois Department of Veterans Affairs Director Erica Jeffries later claims that on this date, her department “shut down the water, we removed aerators from all the showers, we shut down our fountains, we started issuing bottled water” because of the outbreak. August 21: Illinois Veterans’ Home resident Melvin Tucker develops a fever. He is given Tylenol. 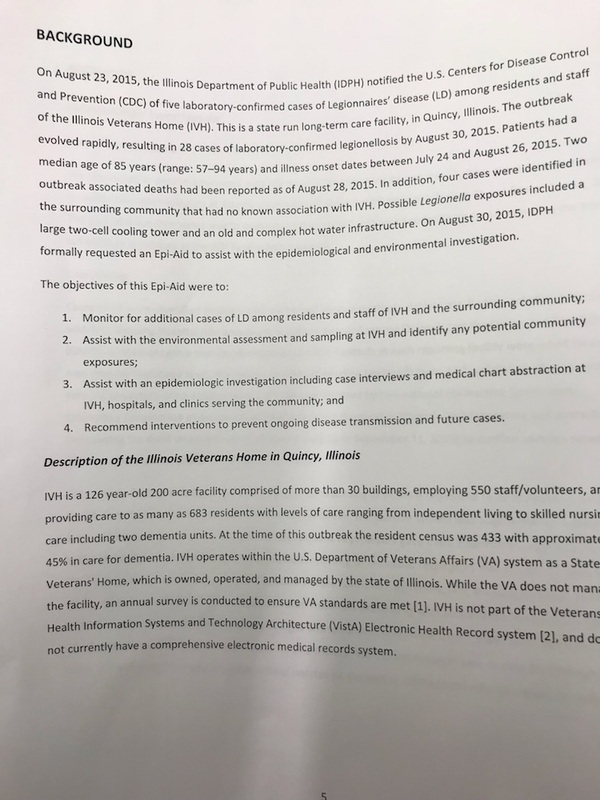 Aug. 25: Rauner’s press secretary at the time, Lindsay Walters, directed press aides in the Illinois Department of Veterans’ Affairs and Illinois Department of Public Health not to issue a public statement about the growing Legionnaires’ threat at the home, documents show. “I do not think we need to issue a statement to the media. Let’s hold and see if we receive any reporter inquiries,” she said. Aug. 26: There are now 28 Legionnaires’ disease onsets, the CDC reports later. August 26: Three days after CDC was first notified of the Legionnaires’ disease outbreak, and 2-4 days after remediation efforts began, Gerald Kuhn, 90, is given Tylenol for a fever that reaches 104 degrees. Kuhn asks to go to the hospital and tests positive there for Legionella. August 26: Last day Dolores French is seen alive. Her military veteran husband lives in another section of the complex. August 27: After six days with a fever, Melvin Tucker is still not on any kind of antibiotic and hasn’t yet been tested for Legionnaires’, despite the CDC being notified four days earlier of an outbreak and the state announcing eight confirmed cases that same day. August 29: Dolores French is found dead and her body was decomposed. Her only underlying medical condition was deafness. August 30: IDPH formally requests Epidemiologic Assistance (Epi-Aid) from the CDC. August 31: Melvin Tucker and Gerald Kuhn die, bringing the death total to four. August 31: Three CDC Epidemic Intelligence Service Officers and one environmental health specialist arrive at the veterans’ home. September 1: E-mail to Illinois Department of Public Health Director Nirav Shah: I received a voice message from Ann Irving with AFSCME asking about the remediation plan at Quincy vets home. She would like to know at what point we can say the systems that present the greatest risk of spreading Legionella bacteria have been cleaned. When can we say that any additional cases are due to the 2 week incubation period and not due to current exposure? September 2: E-mail from IDPH spokesperson to administrative group: Can you help me? Let them know I’m not the one who should be responding. I fight enough with the media. I don’t went to fight with the union too. September 2: E-mail from Director Nirav Shah: I think we should refer them to the Gov Office. There are several other sensitivities here. Or as Craig suggests, to DOL. I agree that weighing in here is not our job. September 9: Adams County health officials report 2 more deaths. September 14: Another resident dies, bringing the death toll to 12 out of 54 who have by now contracted the disease. Spring/Summer: Between April and June 2016, testing within the home’s water system found the bacteria that causes Legionnaires’ between 42 percent and 90 percent of the time, state records show. September: [Quincy home administrator Troy Culbertson] said no one is hiding information. He explained that we have a big responsibility. What we say and how we say it is very important. There is a responsibility to public safety, to economic development in the Quincy area and tourism. Cases emerged in March, May and September of , but there was no public acknowledgement of those cases by the state until WBEZ pressed the question last December. No written press release was issued about the two October cases, though a draft press release circulated to the Adams County Health Department alluded to the undisclosed cases earlier in the year, records show. That release never was made public. Instead, the state initially called media outlets only in Quincy to report just the two October cases. That outreach didn’t happen until about four days after the second positive case that month, records show.